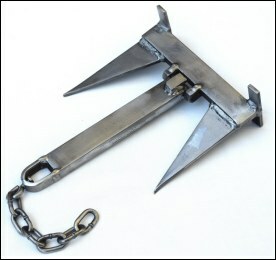 In the early 1970s, when I started trapping in the West, drags were my main hook-up for trapping. There was lots of brush for the animals to get hung up in, and much of the time the ground was too hard to drive a stake. I used Mike Ayers drags and his 'Dog Knot' stakes until I started making my own. 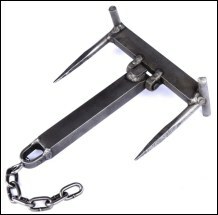 I used various sizes and weights and ended up with the Tracker™ Drag (rigid), the Tracker Plus™ Drag (pivot) and the Tracker™ Pro Drag with forged points (rigid and pivots) which I make today. Choose a drag taking into consideration the size of animal you are trapping and the amount of brush in the area. You don't want him to go a country mile, yet you want him to be able to get away from the set. An old idea improved. Both points digging in, wide shovels pushing points down, plus the right degree of pivot to keep the points digging in and not walking on top of the ground. Customer pays all shipping on drags. Single drags available for $20 each. Call or e-mail for details. Single drags available for $20 each. 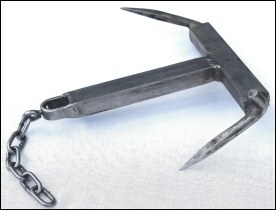 Rigid with hand forged points digging in. Available in 1- 2 - 3 - 4 lb. 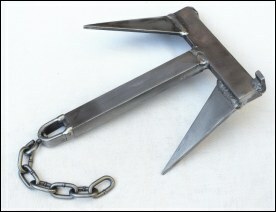 Forged points with pivoting head that lets both points dig in at the same time. Forged points with pivoting head that let both points dig in at the same time. Available in 2, 3 and 4 pound.